Bonus Lvl 1 Lvl 30 Spirit req. Bisha's Centipede is the Guardian Spirit of Date Shigezane. Guardian Spirits can be chosen to provide the player with certain benefits. Activate Living Weapon by pressing △ + O (B + Y on Xbox/Steam controller) when the Amrita Gauge is full. The centipede is revered by many as an envoy of Bishamonten, a powerful god of war and affluence. The centipede's many legs symbolize different things to different groups; for warriors, the legs embody the discipline to march forwards, never retreating, a trait desired in any soldier; but for merchants, they represent the footfall of customers, and by extension, prosperous business. The Guardian Spirit Talisman effect involves Bisha's Centipede moving towards the target at mid range, then heading back to William to attack enemies in front of him for several seconds. 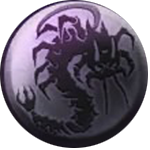 Bisha's Centipede offers a huge increase to Money Earned From Enemies, while also bestowing many powerful advantages that increase the effectiveness of close range combat. His boost to Close Combat Damage does however negate all damage increases for attacking an enemy from the rear. Might Rate at which the Living Weapon gauge decreases if you are hit while using the Living Weapon. Action Rate at which the Living Weapon gauge is reduced when you consume Ki while using the Living Weapon. The higher it is, the more you can use it. Recovery Rate at which the Living Weapon gauge recovers when you absorb Amrita while using a Living Weapon. Tenacity The effectiveness of a Living Weapon that is active when your Life is under a certain level. Amrita Gauge Rate The rate at which you gain Amrita. The higher it is, the qicker the gauge fills. When the Amrita gauge hits maximum, you can invoke a Living Weapon.